One of my favorites moments of every single day is first thing in the morning, when she first wakes up. She normally wakes up before we do and I wake up to the sounds of her squealing and jabbering coming through the baby monitor. I will lay in bed for quite a while and just listen to her, because it makes me smile. When I finally get up and go into her room, the second she sees me, she gets super excited and scrunches up into a ball and then kicks and laughs and grins non stop. Seriously, can you think of a better way to start your day?! 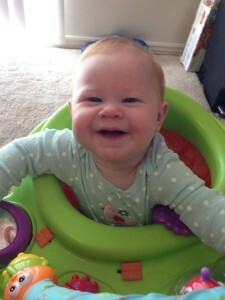 Recently, (over the past few weeks) she started pulling herself into a standing position, so now when I go into her room in the morning, half the time she is already standing up, grinning as big as she can. All I can see over the edge of her crib are her eyes and the tops of her cheeks. She is just so funny. 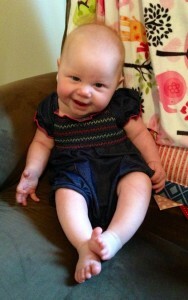 She has developed the awesomest personality (as if it wasn’t already awesome before!) 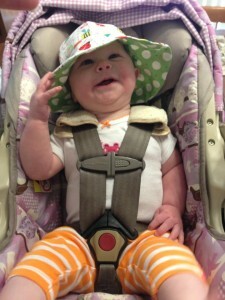 she’s definitely a character and is starting to make silly faces and do silly things to make us laugh. 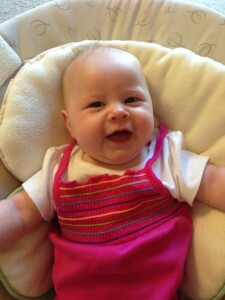 When we do laugh, she gets so excited and breathes really fast and grins so big her eyes nearly shut (sometimes they do!) She has the coolest laugh ….really, not so much like the average baby’s laugh… hers is… I don’t even know how to describe it LOL Well, it’s like a big person’s laugh in a teeny body. LOL She is now getting into anything and everything that’s possible and constantly crawling around and exploring. 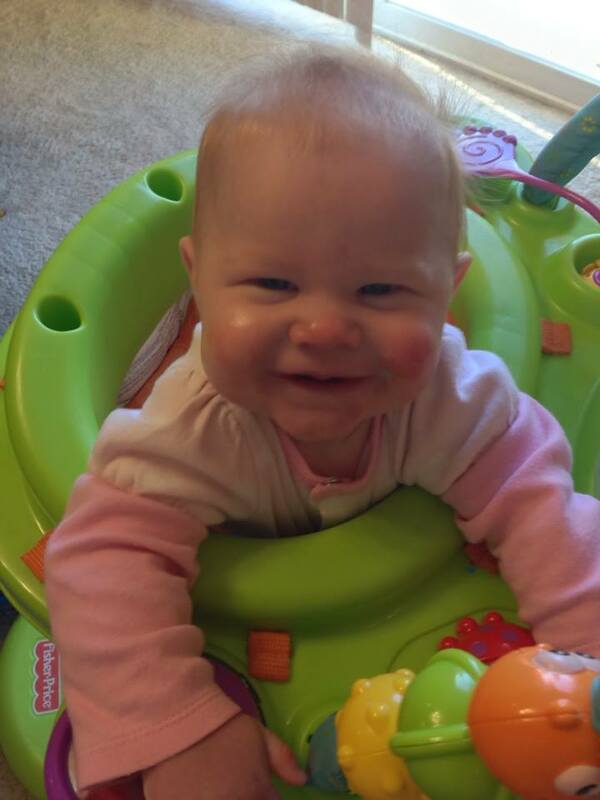 She likes to go through things, hardly ever around things… such as climbing over and through the dining chairs, table, high chair, etc. she’ll just climb over the base pieces and flop on the other side when it’s too high. This often results in her calling for help because she gets stuck in places she doesn’t fit in, or her body is too small to make it over such big obstacles. She just doesn’t know that yet. She’s extremely independent and doesn’t hold still much, unless she’s very tired. She makes me laugh every single day and I love not knowing what adventures (trouble) she’s going to get into every day. This week she discovered that she could lift and dump Gideon’s water bucket… and she thought that was oh-so-hilarious. HAHAHA Even with the huge puddle of water I had to clean up, I couldn’t help but laugh and kiss her because of that grin on her face. She is growing so, so fast!!! 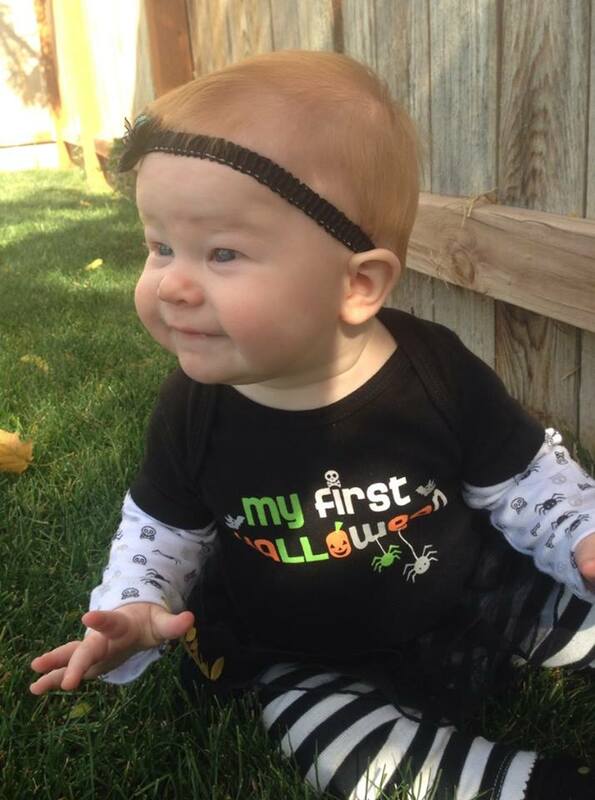 Today is Amelia’s first Halloween! No, we didn’t buy a costume for her… Maybe next year when she’ll have a small understanding of Halloween and dressing up (and we can actually take her trick-or-treating) we’ll do one… but this year, this was sufficient. And she’s freakin’ adorable.